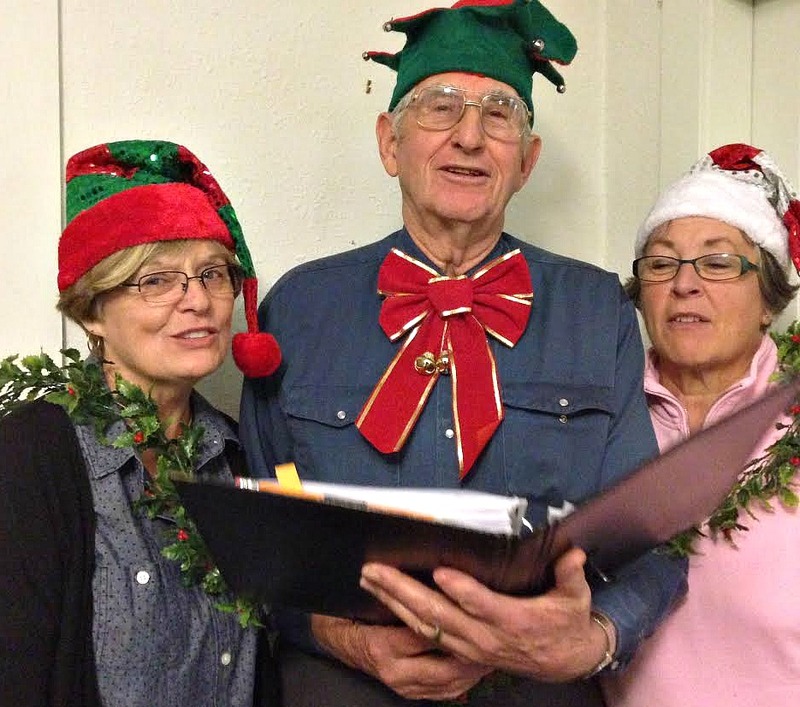 Local dancers, carollers, and bell ringers usher in the season at the Community Christmas Concert on Sunday November 29 at 2:30 p.m. at the Frank Venables Theatre, 6100 Gala Street. The annual musical revue is a family–friendly event with quizzes and prizes to be won throughout the show and goody bags for children at the end of the concert. Admission is by donation, and goods for the Oliver Food Bank are also welcome. The new venue for the concert is made possible through a co-presentation between the Oliver Community Arts Council and the Oliver Community Theatre Society. The Oliver Dance Studio (pictured above) bound onstage with a spritely opening featuring a young troupe of dancers under the direction of Leah Moen. Next, crowd-pleasers Mikie Spillett and Ken Repkow return. They are sure to delight the audience with their country-rock carols. Several choirs give a sneak preview of their December programmes: the Sage Valley Voices (pictured left), the Oliver Elementary School Chorus, and the Holy Cross School Choir will each tantalize with a few selections. A flute and clarinet duo, Lori Martine and Brian Mapplebeck, will set a wintery mood with pure crystal tones. Also chiming in the season will be the Oliver Elementary Handbells Team. Two local songstresses with powerful pipes, Aimee Grice and Dawn MacRae, will each perform some seasonal numbers. Winding up the afternoon will be more little lords leaping and little ladies dancing to send the audience on its merry way. Between sets, MC Penelope Johnson will keep the audience guessing with festive-themed quizzes from holiday traditions around the world, to winter activities, to knowledge of seasonal songs and carols. Who knows, perhaps prizes will also be awarded for high-spirited folks who dress in seasonal costume and colours! Prizes have been generously donated by Your Dollar Store with More and include two larger gift certificates in addition to the small prizes awarded. Goody bags have been provided by The Bargain Shop and members of the Oliver Community Arts Council. Sponsored in part by Oliver Daily News — visit them here! Many thanks to Brian Mapplebeck, program organizer and stage manager, to Tom Szalay and Nathan Linders on sound and lights, to stage crew Diane Gludovatz, Terry and Janice Goodman, greeters Shirley Corley-Rourke and Brita Park, the Oliver Ambassadors, and the Oliver Community Theatre Society.